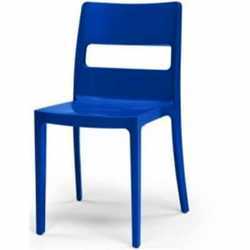 SAI is a stackable ergonomic chair, with a polypropylene frame reinforced with fibreglass, manufacture with air moulding technique. Suitable for outdoor and indoor facilities. Size: W48 D51 SH46 H82 cm. fireproof flax, fireproof red, fireproof light grey, fireproof yellow, fireproof orange. Minimum order: 6 chairs, or multiples of 6.